In the early part of the twentieth century, a Canadian named Bishop White visited China. 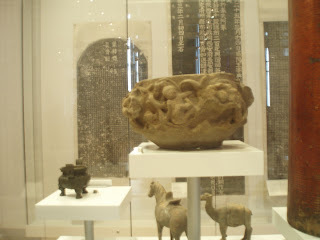 Among the materials he collected were the artifacts from the fifteenth-century synagogue of Kaifeng. 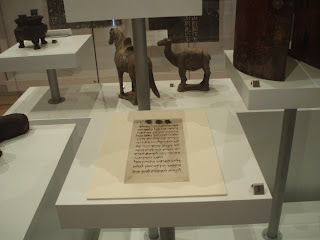 I have read about the Jewish community in Kaifeng, and for me, seeing these few items was a high point of my visit to the Royal Ontario Museum. 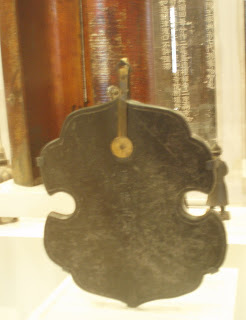 Included on display are a violin-shaped stone plaque, a stone drain outlet decorated with images of vines and monkeys, a laquer torah box, a small leaf of paper written in Hebrew, and a large stone stele displayed as a rubbing. The stele, dated 1489, specifies in Chinese that the original synagogue building dated to 1163; however, the community was already well-established. At least a thousand years ago, when a few Jewish traders settled there, Kaifeng was the capital of the northern Song kingdom in China. As the capital it also served as an important terminus for goods from Europe and Asia. Much later, scholars began to use the term "The Silk Route;" in fact, traders of many ethnicities for many centuries transported a wide variety of goods along several routes from Turkey and the Middle East through various parts of Asia. The Jewish traders seem to have established a community and a synagogue by the end of the Song era in the early 12th century. They were all or nearly all men, and married women from the community. At the time, a woman in that culture accepted her husband's ways, so after a few generations, the Jews were visually undistinguished from their Oriental neighbors. Kaifang in the twelfth century was a particularly interesting capital city, and the other artifacts in the case document its fascinating ethnic diversity and its vibrant life. I'm not going to make this into a detailed description of what I've read -- you can look it up! 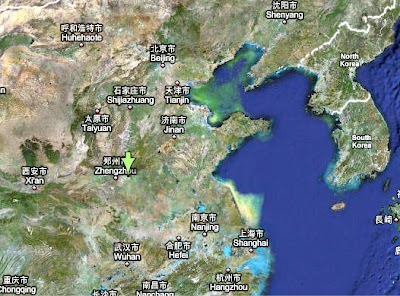 European discovery of this isolated Jewish community -- left in a backwater after the fall of the Song Dynasty -- is an interesting story in itself. In the early seventeenth century, a Jesuit traveler to China documented contact with the Jews of the synagogue, who were still maintaining Jewish tradition and could read their Hebrew torah. Later, the tradition was lost, though the Jews remembered their ethnic origin, and remained somewhat identifiable. By the early 20th century when Bishop White procured the artifacts, the synagogue had been destroyed and there was virtually nothing to identity the former Jewish community; the people who sold him these objects had only a vague idea of their past. Needless to say, the events of the 20th century have further obscured the distinctness of their descendants, though a great deal of scholarship into records of early travelers has produced evidence about the history of the community.